The moment you set foot in Avio Aero Polska you have a clear impression of modernity, precision and north European rigour: bright offices and open spaces, glass walls, minimal and contemporary furnishings. But it’s enough to exchange a few greetings, to have a look in the gaps between one machine and another in the factory lines, to discover something culturally astounding. Like veiled photos of the gulf of Naples at someone’s desk and people who greet you in Italian or even, once they realize they are speaking to an Italian, prefer this language to the global English. And you can even make out some amusing Neapolitan inflexions in the Italian of some workers. Yes, even the factory workers here speak more than one language. To understand more of this strange phenomenon, we need to take a step back in time and in the history of Bielsko Biala, a town of roughly two hundred thousand inhabitants in the Silesian region in south east Poland. In fact the large industrial area in Bielsko is dominated by Fiat factories and the only other great actor on the scene is GE aviation. The industrial area was born over the 70s and 80s, and brought work and industries to a Poland which was sadly oppressed beacuse of the annexation to the URSS after the post-war partition. Today, Avio Aero Polska is naturally part of GE Aviation. Back in the 90s, when it still belonged to Fiat, it used to be no more than a center of engineering and design where few more than 20 engineers worked. “I joined the company in 2005; there were only 70 workers and the factory had only been in existence for little more than a year” says Andrzej Kaczmarczyk, Coordinator of Production at Bielsko. “We mainly dealt with four motoring programs: CFM56, T700, GE 90 and PW308. We used an elementary manufacturing system, very old school: grinding and milling and we weren’t able to finish the products, carry out aluminization, plasma or special treatments”. Exactly twelve years later, approximately 300 workers are employed at Bielsko-Biala’s shop floor and programs of the future of the aeronautical industry have been added: LEAP, GEnx and GE9X, respectively the motors of Boeing 737 and Airbus320-neo, Boeing 787 Dreamliner and 777-X. Soon the ATP (since last March 2018 officially renamed GE Catalyst) will also become a daily working reality. Not only that, the product now enters as raw material and comes out finished and there are brand-new lines that have become the “house specialty”: here parts of the low pressure turbines of these air engines are manufactured, such as all the stator turbine stages of the giant GE90, GEnx-2B,GEnx-1B, LEAP as well as all stages of GE9X. Here are also manufactured different stages of the blades for PW308, T700, CFM56 and GE90. These are numbers and developments that would surprise any industrial expert, especially if they belonged to the aviation industry. “The GEnx-2B certainly represented the turning point” continues Andrzej, “we had very little experience but we went for it: we arrived at 15 motors a month, supplying the stators from 2 to 6 stages of the turbine. We brought home thermal treatments and special processes”. How? Here is revealed the second historic motive for the Italianity of Bielsko, or better for its neapolianity: in fact even in those days Pomigliano d’Arco and the then fellow site of Acerra (just a few kilometers away), represented the center of excellence for the production of stators and rotors for LPT (Low Pressure Turbine) for civil and military aircraft engines. Experts, technicians and engineers flew every week from Capodichino to Katowice or Krakow, bringing solutions and adding skills for the manufacturing process. Some of them even stayed there for a long time, like Antonio Guarino, who is Senior Operation Manager at Pomigliano and has revealed that many operators and technological engineers spent long periods training in what is today the Airfoils Centre of Excellence (turbine blades) of Avio Aero. “After a while they even learned Neapolitan which they heard us speaking among ourselves and that we taught them in our leisure time”, illustrating another Polish characteristic and talent: they’re fast learners and impressive at committing themselves. History repeats itself because what happened for GEnx-2B was consequently paid back with interest by the professionals of Belsko Biala for LEAP. “I think that the quick transformation, expansion and improvements in manufacturing in the previous 5-6 years have helped us to face the immense amount of work that we have for LEAP with more courage: today we have 12 engines delivered each week, 18 in 2018 and even up to 45 for 2020!” says Wojciech Korczyk, Manager of the LEAP lines of the Polish factory. He speaks as a veteran, but he’s young, and he too speaks Italian. He learned a lot from his Pomigliano colleagues and since 2013 he has given them support in the construction of the ultra-modern lines dedicated to the production of LPT Nozzles, 3 stages for each configuration: LEAP 1A/C (the one for Aribus 320-neo family) and 1B (for Boeing 737-Max). “We completed the first line in 2015, and today we have 14 lines” he says with a pleased smile. You can understand the reason for his smile when he explains that “LEAP has completely changed our idea of manufacturing, or rather the unprecedented ramp-ups of production pushed us to rethink it. We wanted to optimize and simplify the manufacturing, avoiding the need to move a machined part around the factory to undergo the various processes, and avoiding the waste of time preparing the machines for every replacement of the product to be machined or the machining itself. We designed the layout by realizing a cell where the operator can carry out up to 7 operations; applying principles of Lean Manufacturing; dedicating machines to certain processes and obtaining constant and complete production flows". These are hyper technological cells, equipped with robots and electronics, which are managed by each operator through a computerized interface with the highest efficiency. Efficiency is a strong belief in Avio Aero Polska, like planning and quality. Bogdan Klapyta,Technology and Stator cell Manager in Bielsko, deals with legacy programs (those programs which have made history and built the foundations of this factory), but he also (and with much dedication) deals with New Product Introduction, as the new latest generation engines, GE9X and ATP are defined in GE Aviation. “The 9X was the first program of the future that we worked on, pledging to increase further collaboration with Engineering and Quality” says Bogdan. “We worked really hard to prepare ourselves for the production of all six stator stages of the 9X. We are ready and determined to deal with volumes that are expected to be challenging all the same. And for ATP we have also changed our approach to the way of working: efficiency and the speed of working became even more important to us”. In fact at Bielsko we will manufacture the rotor blades for the three stages of the Power Turbine for the promising TurboProp, now in the process of dealing with the FETT (first engine to test). Lean Manufacturing at Bielsko Biala is almost a life philosophy. You realize this by observing the LEAP lines, and then the other machines, the areas of arrival and delivery: there’s order, cleanliness and a kind of standard structure for the trolleys, the shelves, the containers next to the machine, between the lines. “It’s the first application in Avio Aero of this Kaizen specific Lab” says Jakub Huma, Lean Manufacturing Leader of Avio Aero Polska. Kaizen is the methodology which started in Japan which has among its many advantages a great technical autonomy, efficiency and detailed care of the factory spaces. “We have a laboratory which we call MoonShine Shop, just like the laboratory of Sensei Chihiro Nakao, the inventor of the lab and guru of the Kaizen. There we are busy finding solutions for the equipment and tools which support production, improving flow and optimizing space”. Incredibly, this laboratory is next to the canteen and Robert works there, a specialized employee who could hold courses for IKEA or Leroy Merlin, and who uses wheels, steel beams covered in plastic, screws and bolts, cutting machines and designs to produce effective tools for all his colleagues. Returning to the special processes, and to the progressive and absolutely modern way of interpreting the work, we are pleased to discover that a woman leads these kind of processes in this factory. “After a period of training and very important work in Rivalta, from 2015 I became manager of Thermal Treatments for all the motor programs that we manage here” says Malgorzata Fajkis. She is the first woman in charge of a manufacturing area in Bielsko and coordinator of the Women’s Network, which collaborates with the EDC of Warsaw, the GE businesses of Healthcare and Power in the country, and invests time and care to promote women in technology, including whoever is interested in the initiatives. And to judge from the number of technicians, engineering operators and designers who are women at Bielsko, it’s working rather well. 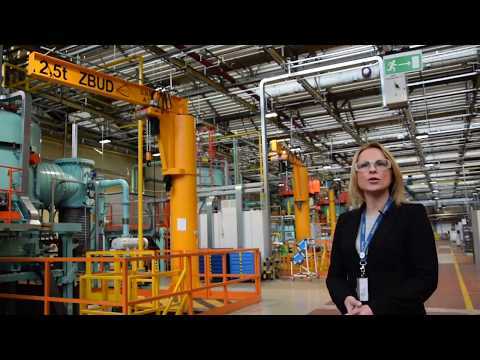 Paulina Gladysz has been HR manager at Bielsko since 2012 and she tells us about a 42% growth of the total population in the last seven years, and right the same amount of time has been spent by Roberto Bertaina, today also the Plant Leader of Avio Aero Brindisi, in Poland. “My experience at Bielsko-Biala started right on the shop floor, I had different roles and responsibilities, since the last two years as the Plant Leader” Bertaina says. “It has been a tough and long path, but today the industrial and processes transformation looks very clear. Avio Aero Polska will close this year with all indicators aligned to the operating plan, as a confirm of the maturity level and excellence performed by this team”. The collaboration with engineering has been central for the 9X, said Bogdan. Witold Grela, the head of engineering of Avio Aero Polska, is also very convinced of this. He started 17 years ago, when the factory didn’t yet exist, there were about 26 engineers in the design center, he has seen it being born and evolving. “Today there are 100 engineers, many young people and some of them who are also part of the GE Edison designer program” explains Witold. And speaking of the relationship with the colleagues of the Global Supply Chain, he says that “it has changed progressively over the years, passing from working in isolation to the current harmonization, sharing approaches and objectives. There’s an incredible potential in the synergy between operators, technicians, quality engineers and planners: all dedicated to the quality of the product, reduction of cycle times and reduction of waste. We have managed to grow thanks to understanding each other’s motivations, limits and constraints and so we can exceed limitations, adapting to each other”. Visiting these places you really have the impression that Poland itself has evolved. You don’t just notice it because of the extraordinary nature of these professionals, their acumen and their competence but also because of the streets and the buildings you see. From the brand new airport in Krakow, which until two years ago was an anonymous landing strip in east Europe, but today is on a par with Munich. A country which, after the developmental phase of the 80s and 90s, is in a moment of consolidation and absolute evolution. The European president is the Polish Donald Tusk, and the flows of migrants come nowadays here from the Ukraine and former Soviet countries. Poland seems to have left behind the post- communist industrial melancholy, allowing itself a Teutonic precision accompanied by a certain intellectual vitality. You better believe it...Poland will continue to surprise.